케이글 주지사 후보 "한인사회 사랑합니다"
Hyundai Heavy Industries, the world's largest shipbuilder, and second-ranked Daewoo Shipbuilding and Marine Engineering are seeking a merger. The result will be a mammoth company with a combined global market share of 21 percent. Hyundai Heavy on Thursday signed a memorandum of understanding to buy state-run Korea Development Bank's entire 55.7-percent stake in Daewoo. The merger is being pursued at a time when orders for liquefied natural gas and very large crude carriers are rising after a long time in the doldrums and painful downsizing in the industry. Reuters reported that the merger will "create a global heavyweight controlling over 20 percent of the market." And U.S. industry paper Maritime Executive said Hyundai Heavy will gain an edge in competition with Chinese rivals. The combined order backlogs of the two shipbuilders stand at 16.98 million compensated gross tons, which translates into a global market share of 21.2 percent. That is three times more than the order backlog of third-ranked Imabari Shipbuilding of Japan (5.25 million CGT). Hyundai and Daewoo have competed fiercely for orders and got into trouble for trying to underbid each other, with sometimes disastrous consequences. Combined, they will have a competitive edge. The timing could not be better as Daewoo is improving its performance amid the industry's recovery from its worst-ever slump. It managed to post operating profit of W733 billion in 2017 and W780 billion in 2018, when Hyundai Heavy and Samsung Heavy Industries were in the red. Drastic downsizing is nearly complete, with the total workforce reduced from 13,500 in 2015 to 9,500 as of late last year. And the acquisition costs are relatively low as the industry is not in a boom cycle. In 2008, Hanwha Group tried to buy Daewoo for W6.3 trillion but called it off due to the onset of the global financial crisis (US$1=W1,115). Hyundai Heavy is likely to pay a maximum of W2.5 trillion in capital injection. The merged shipbuilder can then bid for a W12 trillion Qatari LNG vessel order expected late this year. Labor opposition is a risk. 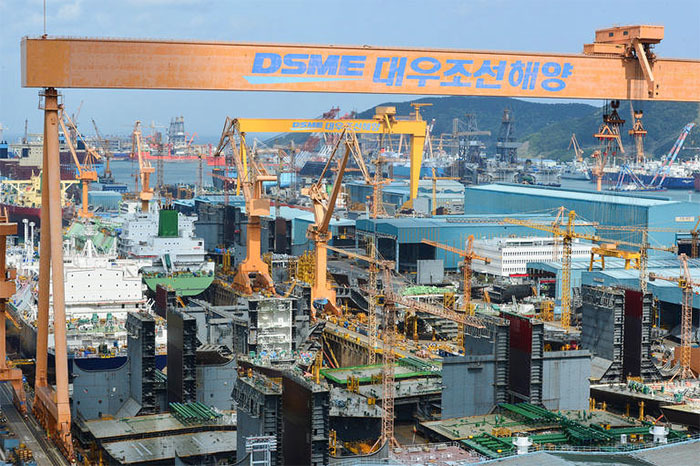 The Hyundai Heavy union on Thursday postponed a vote on pay negotiations with management, and Daewoo's union is calling for a halt to the merger and threatening to strike. There are also fears that the merger could make it harder to slimline the companies, and opposition politicians are accusing the government of tossing state-invested Daewoo over to Hyundai Heavy to wash its hands of the problem.